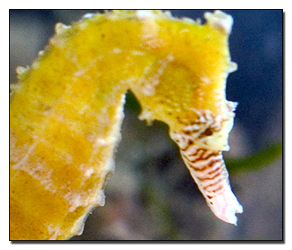 The purpose of this guide is to provide a reference, or starting point, in identifying and treating some of the most common diseases and medical conditions of seahorses in home aquariums. It is not, however, set in stone; constant scientific research and anecdotal evidence cause the seahorse hobby to evolve every day, furthering our understanding of these diseases and conditions, how they manifest themselves in our fish, and how we can best treat them. This guide should be used responsibly and not as a sole reference. If ever presented with diseases in your seahorses, use this guide first, but always trust your own knowledge and common sense when treating your seahorses. Please feel free to share any anecdotal information you have via e-mail or on our discussion boards. Additionally, please be aware that pathogens affecting seahorses are living beings that can adapt and become resistant to treatments if performed incorrectly. When using antibiotics and other medications, be sure to follow the manufacturer's instructions completely and through the entire suggested treatment period. Due to the adaptive nature of bacteria and other pathogens, failure to do so can cause the evolution of strains resistant to current treatments. If necessary, seek the assistance of a veterinarian to ensure that no treatment is left unfinished. Cryptocaryon irritans, Amyloodinium (Oodinium) ocellatum, Brooklynella hostilis, parasitic crustaceans, gill flukes, Glugea, etc. Ectoparasitic infections are most often caused by poor quarantine and pre-treatment practices. Most wild fish, including seahorses, routinely harbour ectoparasites with no problems. When infected fish are put through the stress of capture and transportation, weeks in holding facilities without food, and the sometimes volatile conditions that can occur in closed systems such as aquariums, their immune systems are weakened, and the parasites are given a chance to overtake their host. With proper quarantine and treatment before being placed in the display aquarium, often ectoparasites can be eradicated with ease. visible parasites upon examination manifested as white spots, ulcerations, blisters, etc. External parasites can cause death by several means, the most common being direct parasitism (stealing vital nutrients from another organism's blood or other bodily fluid), suffocation, and opening the gates for secondary infections. External parasites can consume so much of their host's nutrients that the host may wither and die from malnutrition. 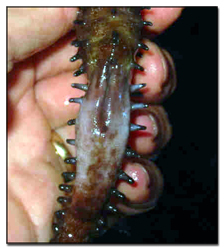 Suffocation can be caused by severe infestation of the gills (gill flukes). Also, parasites often cause open sores along the body of their host, and this, compounded with stress due to lack of adequate nutrition, leads to internal secondary infection, usually by a bacterium. The best treatment for any parasitic disease is prevention by careful quarantine. 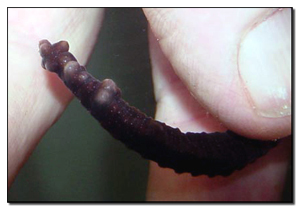 If this is not feasible and parasites do emerge in the display tank, treatment options are wide. They must, however, be used in a quarantine tank. Formalin is one of the most common and economical chemical treatments for external protozoans and flukes. It is best used as a dip per the instructions of the manufacturer. Malachite Green is an effective chemical dye that can be used in treating most external parasites. Use as an extended treatment in quarantine per manufacturer's instructions. 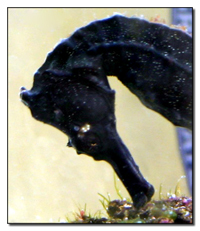 Methylene Blue is a common medication with seahorses. Its therapeutic properties lessen some of the stress brought about by disease treatment. Use it as a dip or as a long-term quarantine treatment. Freshwater Dips are extremely effective against gill flukes. Be sure to match the pH and temperature of the tank's water before proceeding with a dip of this kind. BE VERY CAREFUL WHEN USING COPPER SULFATE WITH SEAHORSES!! Their scaleless skin is extremely sensitive to the abrasive properties of it and other metals. CuSO4 levels should never be above .25 ppm, with levels in the .19 ppm area being ideal. Only treat under close observation as CuSO4 can suppress a seahorse's immune system, opening the door for secondary pathogenic infections. Do not use if other pathogens are known to be present. Protozoans, flatworms, flukes, roundworms, tapeworms, etc. Internal parasitic infections are spread in much the same way as external parasitic infections. With proper quarantine and pre-treatment, often internal parasitic infections can be evaded. In many cases, given appropriate water conditions and health, seahorses can live in symbiosis with internal parasites for many years without problems. Additionally, endoparasites are rare with seahorses. Most commonly, these parasitic worms fix themselves to the infected specimen's digestive tract, constantly consuming nutrients vital to the infected specimen's health. Unless treated, malnutrition follows, leading to death. Treatment regimens for internal parasites are similar to those for external parasites. Most commercial anti-protozoal and anti-worm agents are effective at treating internal parasites. They can be administered via gut-loaded ghost shrimp or Artemia, or by injecting the medicines into dead ghost shrimp. Metronidazole (flagyl) is an effective treatment against internal protozoan infections. It must be ingested. Niclosamide and Praziquantel are both effective against worm infections and must be administered through food to be effective. They may be somewhat difficult to obtain. Freshwater Dips can be effective against some endoparasites such as flukes, though they are generally only effective at treating ectoparasites. Exophthalmia is not exactly a disease, but a stress symptom that can be brought about by many ailments. Most often, however, its cause stems from bacterial infection. Pop Eye can also be caused by parasitic or fungal infections. If the condition appears in only one eye, it may have been caused by physical injury such as being scratched by a rock. If left untreated, exophthalmia can cause damage to the infected eye(s). It can also be a sign of more serious problems that themselves can cause death. There is no direct treatment for exophthalmia. Often all that can be done is eliminating the causative agent. Maintaining stable water conditions and feeding food medicated with an antibacterial (done in quarantine) may prove effective. Large water changes and correction of obvious water quality problems may also be useful in treating this condition. This condition is thought to be caused by either bacterial infection (in which case waste gases produced by the infecting bacteria become trapped under the skin) or by gas super-saturation of the water in which the seahorses reside. Gas super-saturation causes problems similar to the bends, which affects SCUBA divers. The situation, in which gas levels in the water are much higher than normally possible (caused by limited areas for gas escape), causes gas bubbles to form where possible. Because the pressure inside of a seahorse is lower than the pressure of gas super-saturated water, the gas bubbles emerge directly under the skin of the affected seahorse. 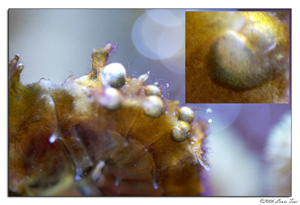 The bubbles can cause stress on a seahorse as problems with buoyancy and movement arise. If left unchecked, the disease may eventually cause death in the infected specimen due to this stress. The appearance of external gas bubble disease can be a sign of more serious problems. Diamox baths are considered to be the best treatment. 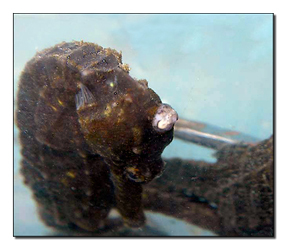 As a temporary treatment, air bubbles may be lanced with a sterile needle to provide some relief for an infected seahorse. To perform this lancing, first sterilize the needle with either isopropyl alcohol or by waving it through a flame. 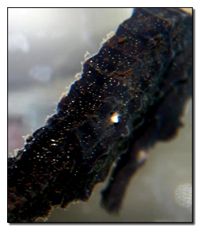 If the flame method of sterilization is used, be sure to cool the needle completely to avoid burning your seahorse. Then insert the needle into the air bubble parallel to the seahorse's body. The bubbles may then be gently compressed to evacuate any air inside. As a precaution, it may be wise to place the treated horse's) in quarantine with an antibacterial agent for one or two days to allow time for the puncture to heal. The above italicised treatment is currently under review, as it is not currently thought to be a good idea to puncture the seahorses skin. Unless the cause of EGBD is not rectified, it will often return within days or weeks. Changes to the tank setup may have to be made if the condition does indeed return. First, try a series of large water changes. Often bad water conditions can trigger external gas bubble disease. Secondly, a power head can be aimed at the surface of the water, providing surface agitation and gas exchange. If the condition continues to recur, the tank setup itself may need to be revaluated for parameters including height, etc., that can affect external gas bubble disease. 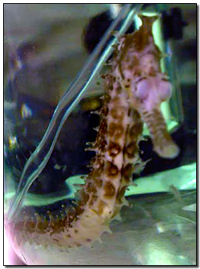 Raging bacterial infections such as those associated with the consumption of seahorse flesh are spread through contamination of uninfected seahorses with infected seahorses. Often the causative agent, the bacterial genus Vibrio in most cases of flesh erosion, will lay dormant unless given the opportunity to become active. This opportunity usually coincides with a deterioration of water quality. With proper quarantine and treatment, however, this disease can be avoided altogether. Infections of this type, almost always bacterial, can cause an awful death for seahorses. The disease manifests itself by consuming the seahorse's flesh all the way to the bone, causing irreparable damage that leads to death. The best treatment for bacterial infections is always preventative quarantine, but if an infection is present in the tank, hospitalization of the infected specimens and treatment with antibacterial agents is the only solution. Combination drugs such as Furan II and Paragon II are often most effective at combating bacterial infections. These drugs cover both spectrums of bacteria (gram+ and gram-), and can usually halt progression within days. Use the marine dose per the manufacturer's instructions. Drugs from the tetracycline family may also be of some help, specifically doxycycline and oxytetracycline, though they may be somewhat difficult to get a hold of. Topical treatments such as neomycin (Neosporin) and iodine or formalin solutions (1 cup water to 15 drops of either or both) used three to four times daily on the affected area can also help in controlling the progression of the disease. Advances are being made in the way of creating seahorse vaccines that could possibly eliminate the occurrence of infections of this type. The most likely causative agent in most cases is Vibrio sp., a bacterium with high resistance to most drugs available to hobbyists and institutions alike. If the disease returns, the infected horses will need to be requarantined, the display tank may have to be scrubbed down, and all equipment may have to be sterilized with bleach. Be careful not to allow any sterilization chemicals to make their way back into the aquarium as this will destroy the essential denitrifying bacteria present in the aquarium's bacterial filter bed. If this does not arrest the occurrence of flesh-eating bacteria, the seahorses may have to be relocated to a new display system. The possible causes of internal gas bubble disease are a constant topic of conversation (and argument). It is thought to be cause by some of the same factors as external gas bubble disease—gas super-saturation or bacterial infection. Unfortunately, if given the opportunity to progress to actual total-body bloating, it is often too late for the infected seahorse. The most grave problems with internal gas bubble disease lie in its crippling effects on the infected specimen's internal organs. If allowed to progress, often the organs are damaged beyond recovering, leading to severe organ failure. Treatment of internal gas bubble disease is often difficult and not practical. There are currently only two proven ways of treating this medical condition. Decompression involves placing the afflicted seahorse in a decompression chamber that is at least three times deeper than the height of the tank in which it resides regularly. The seahorse must be kept on the bottom of this chamber, and it must remain there for hours, at least. This treatment is often not possible as resources needed are generally not available to hobbyists. Additionally, the organs are often too damaged for this treatment to be successful. Perhaps more promising is the use of a drug called acetazolamide. This drug, called Diamox in the medicinal trade, is very successful at treating all gas-related seahorse disorders. To use it, a solution of 1/8th of a 250 mg tablet should be dissolved in one cup of water. The solution should then be injected into ghost shrimp, which are then frozen. 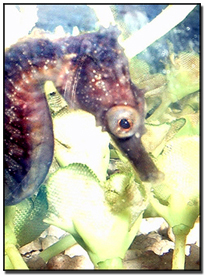 The prepared shrimp are then fed to the affected seahorse at a rate of two per day for four days to complete treatment. This treatment must be administered very early to work, but if done correctly, success rates can be high. 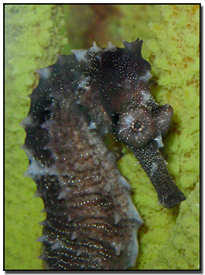 As with internal gas bubble disease, the causes of pouch emphysema are highly disputed within the seahorse hobby. It was once thought that the condition could be traced to embryonic that is not expelled during labor rotting inside of the pouch. This decomposition process would yield gasses that inflate the pouch. Do to the fact that the condition often shows up in 'virgin' male seahorses, however, other theorized causes may be more reasonable. These include micro-bubbles in the water column that can collect in the pouch during mating rituals and bacterial infections, the waste products of which include gases that can fill the pouch. This type of infection is often attributed to recurring pouch emphysema. More recent research, however, has traced a more likely cause to a biological process known as the hydration of CO2(g), carbon dioxide gas, to H2CO3(aq), carbonic acid. This process occurs on a cellular level. An enzyme known as carbonic anhydrase catalyzes the hydration of CO2(g) with H2O(l) to H2CO3(aq), carbonic acid. When this reaction is disturbed, however, CO2(g) is not converted into H2CO3(aq), thus leading to a buildup of carbon dioxide gas in the pouch tissues. The exact cause of the disruption of this process, however, remains unknown. 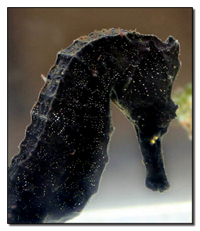 This malady only infects male seahorses as females do not have pouches. 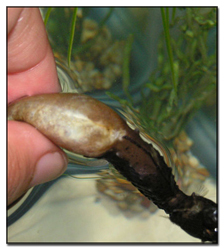 If not treated, the condition will cause the infected male to have limited locomotion and severe buoyancy problems that can lead to stress and secondary infection. Cessation of appetite normally follows, and the horse may starve. Other problems include the possibility of the infected horse becoming stranded on a filter intake, overflow box, or similar piece of equipment. Prolonged experiences like this can cause internal injury and stress. 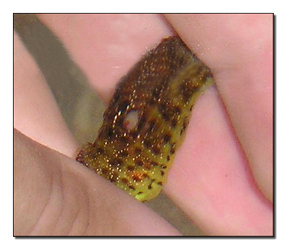 For immediate relief of this malady, the pouch of an infected seahorse can first be evacuated per the instructions of Seahorse.org's Pouch Evacuation article. When you have obtained the needed supplies from either your physician or vet, you will first need to remove the sharp tip of the needle so that the pouch is not punctured. This can be done easily by cutting just above the tip with a sharp pair of scissors. Once the syringe is ready, you will need to prepare a solution of the acetazolamide by dissolving 1/4th of the tablet in 2 cups seawater. The tablet will need to be crushed first to ensure that it dissolves completely. 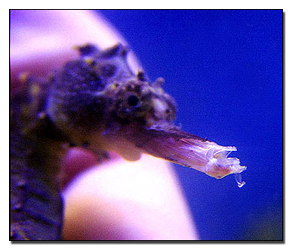 When the solution and syringe are prepared, relocate the seahorses to a container filled with its own tank water. Gently hold the seahorse in one hand while inserting the syringe into the pouch with the other. Be very careful to not puncture the pouch. There may be some resistance when inserting the syringe, but be patient as it will eventually slide in. Once the needle is in, depress the syringe completely to release all of the solution into the pouch. Some may spill out. Now the horse can be returned to his tank. Repeat this treatment the next two days for a total of three consecutive treatments. With any luck, the pouch emphysema will not return. 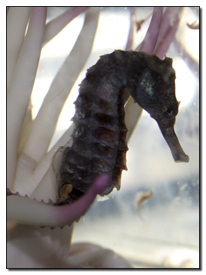 Similar to and likey caused by the same pathogen as flesh-eating bacteria, Vibrio spp., snout rot can often be controlled with pre-treatment before the seahorse is released into the display aquarium. The disease may be cause either by fungal infection (in which case the snout will be pinkish) or bacterial infection (in which case the snout will be white). If left untreated, the disease will often appear when water quality worsens or during prolonged periods of stress. 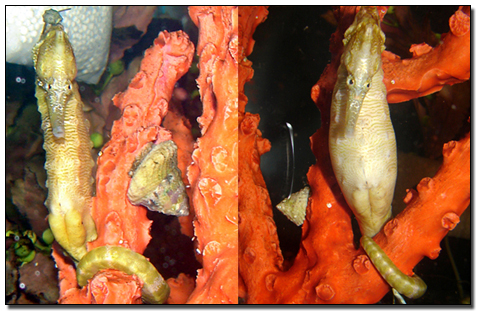 When first infected, seahorses generally are not bothered by snout rot. As this grave disease progresses, however, the mouthparts of an infected seahorse may become so destroyed that eating is no longer possible. This causes inevitable death. As with flesh-eating bacteria, the best treatment for snout rot is preventative quarantine before release into the display tank. The disease will not always manifest itself immediately, however. Luckily, treatment is not very difficult. The best treatment is by use of combination medications such as Paragon II in a hospital tank. This medication covers gram+ bacteria, gram- bacteria, and fungus. It has ingredients that can eliminate or stop the progression of snout rot within days. In severe cases, a double treatment may be necessary. In any case, follow the directions of the manufacturer. Topical treatments such as neomycin (Neosporin) and iodine or formalin solutions (1 cup water to 15 drops of either or both) used three to four times daily on the affected area can also help in controlling the progression of the disease. If after treatment the disease returns, the infected horses will need to be requarantined, the display tank may have to be scrubbed down, and all equipment may have to be sterilized with bleach. Be careful not to allow any sterilization chemicals to make their way back into the aquarium as this will destroy the essential denitrifying bacteria present in the aquarium's bacterial filter bed. If this does not arrest the occurrence of snout rot, the seahorses may have to be relocated to a new display system. This is often, however, not the case.